We’ve posted before about efforts by Savannah Rocks! to preserve musical history and build bridges between generations of musicians and music lovers. 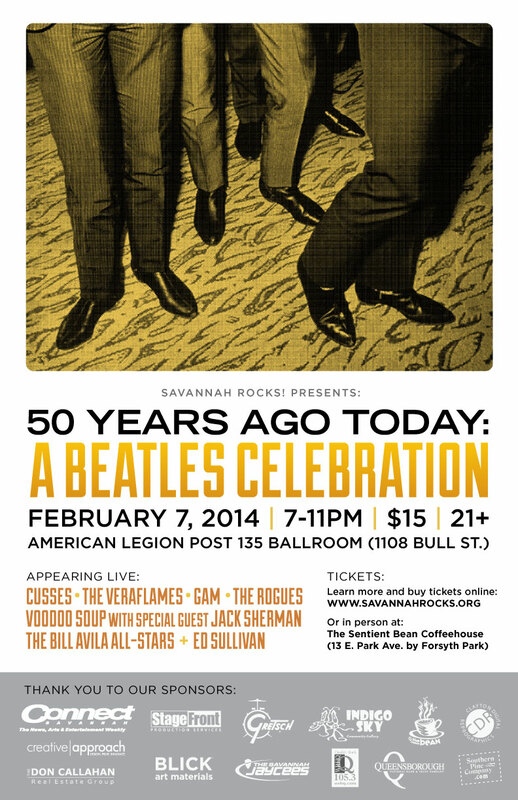 Savannah Rocks!’ user-created bulletin board of local rock and roll history is still hanging at The Sentient Bean, and now we know the full lineup for the big 2/7 show in the American Legion Post #135 ballroom commemorating the 50th anniversary of The Beatles’ appearance on Ed Sullivan. As you can see, the lineup includes CUSSES, The Veraflames, GAM, The Rogues, Voodoo Soup with special guest Jack Sherman, The Bill Avila All-Starts, and Ed Sullivan himself (?). The Savannah Rocks! website has more info about the event, the bulletin board, and the organization’s goals. You can also find them on Facebook. Click here to buy tickets for the 2/7 show — that page also features info on each of the acts. Click here for the Facebook event.